Bootstrap is a popular framework that most of the people are aware of but those who are new to this might be wondering what Bootstrap is all about. Well Bootstrap is a front-end framework crafted by Twitter and its popularity is quite evident with more and more developers and designers getting on board. It helps both amateur and professional designers in building website that is responsive, fluid and most importantly, customizable. With the help of Bootstrap you can design any site that is eye catching, mobile-ready and can attract more visitors to your website. With readymade set of development codes one can not only save lot of time but also ensures that its results are consistent and uniform across all platforms. This addresses a major concern of inconsistency among developers on a project. Bootstrap does this amazing job so effortlessly that we are huge fans of this framework and we hope that you too will be hooked up for good once you start using it. And you will find it useful as well in combination with WordPress or any other blogging or CMS platform. Just for your information, if you have ever wished to build an online store on a tight budget then we have already published a post about top 10 free eCommerce WordPress themes. In this post, we have collected the best free bootstrap based responsive WordPress themes to make your website browsing experience awesome no matter what device is being used. It’s a premium quality and a free bootstrap based WordPress theme for creative agencies and business websites. It comes with attractive design and powerful theme options to help you customize your site effectively. It’s fully responsive WordPress theme so your website look great no matter what device you are using. It is a modern and a highly flexible responsive WordPress themes packed with many amazing features. It comes with eye catching grid based structure and offers you a very attractive design to engage your website visitors. The theme offers lots of features such as Responsive Popup, Header Slider/Touch Slide, Video Background, Parallax Effect, Footer Widget, Infinite scroll, and most importantly WooCommerce Ready so you can build your online store in minutes. Meris is a clean and modern responsive WordPress theme good for both personal and business websites. It comes with many cool features like Full-Screen Sliders, Portfolio Option, Awesome Widgets, and easy Customization. You can easily place contents like portfolios, services, slogan etc. using widgets and also offers you flexibility in terms of layout option. With so many features, this theme looks perfect for business, travel, food, sports, portfolios and other niches. TA Pluton is a minimal still attractive and modern one page WordPress theme with parallax scrolling effect. You can use this them for personal blog, or to promote your product/service and convert your website visitors. It’s fully responsive so your website looks perfect on any device. You can showcase your work in a nice appealing style using a powerful Theme Options Panel. Celestino is a clean, easy to use WordPress theme for corporate and portfolio websites. The theme offers flexible and professional tools to easily organize your contents. The theme is fully customizable and can be modified according to your needs. It’s packed with many features like 8 different types of slider, background settings, header and footer personalization, 8 different types of portfolio, unlimited photo & video gallery, shortcode manager and many more other features. Cordillera is another business WordPress theme which you can use to build personal or company websites. With its flat design and enriched options, you can not only give background style to each section, but also set the section width, split the section into multiple columns, etc. The theme also has a full screen banner, four types of layout, one-click for changing main color and much more. GRIDBY is another popular and fully responsive WordPress theme that comes with responsive full background home page and support YouTube videos. You can create beautiful and animated layout using grid based system. If you working on storytelling or presentation websites, then this theme might be the perfect choice for you giving your readers an impressive reading experience. With this theme you can showcase long-form content without overwhelming your readers. Make your website stand out with Rokophoto Lite Bootstrap based WordPress theme. The theme offers stunning and responsive layout perfect for photography websites. The theme comes with classic design focuses on your content and is perfect for an elegant blogs. Starter is a clean and elegant One Page WordPress theme perfect for business and portfolio sites. It’s fully responsive so you site works perfectly on any device and it’s packed with useful features like page slider, team page, portfolio and client page etc. Moreover, it’s incorporated with Parallax scrolling effect with a modern looking layout that makes your website look stunningly beautiful. Yet another amazing Bootstrap based WordPress theme is TA Magazine. As name suggests it’s a creative magazine style WordPress theme with a fine design and remarkable features. You can build a stunningly website with advanced layout option and highly customizable widgets. Llorix One is a single page responsive WordPress theme that offers a professional and elegant design for small businesses and startups. You can create a site using parallax scrolling feature that makes it even more elegant and smooth. It also provides a customizable ribbon where you can write personal and engaging texts, and its translation ready. TA Music, as name says, is a responsive WordPress theme for music related websites. With plentiful advanced features, you can create music related website for the niche of entertainment industry. You can showcase events, DJ mixes, artists, albums, video galleries and photo galleries in an elegant touch to attract more visitors. Torch is a lightweight WordPress theme based on Bootstrap framework and packed with features like full-screen slider, custom sidebar, flexible page and post layouts, and much more. With so many features included, this theme can be used for different purposes such as business, food, sports, travel, and other topics. Another nice looking photography WordPress theme designed based on the latest trends and is ready to conquer hearts of the audience. You can create any website like art & photography, beauty, fashion, interior design, dating, wedding etc. ensuring that the site portfolio will be in the spotlight and blow away all competitors. Rich functionality of this theme will offer the site visitors pleasant user experience, and you’ll see the true value of seamless customization. Virtue, very true to its name, is truly an asset that has an elegant design and plenty of options. It’s a multi-purpose responsive WordPress theme that can be used for both portfolio and ecommerce site. color, setting up Google fonts etc. A clean, simple and fully responsive WordPress theme designed especially for hobby bloggers to share their favorite content. The theme is SEO friendly and fully customizable. Ward is a lightweight and fully responsive WordPress theme. You can create a truly unique design using this theme that comes with theme options to add your own background, page layout, site width and more. Moreover, you can distinguish each post with one of the eight supported post formats, such as: Video, Image, Aside, Status, Audio, Quote, Link and Gallery. A great looking wedding WordPress theme that comes with loads of options and color schemes to customize the site to your choice. Though it’s a wedding theme can be broadly used for other purposes too. Wembley is another fully responsive WordPress theme with a grid layout that makes it very attractive. It comes with style setting, banner setting, welcome section and a number of other useful options. Evolve is a multi-purpose WordPress theme that includes parallax slider with up to 5 slides on any page and a post slider for 10 posts per post category. There are a number of different slider and animated effects to move captions and images into position and then back out of frame again. It comes with lots of features and with theme options you can easily modify anything with the design, such as the logo, header, background, main colors used, and more. Design your business and corporate websites using Business One fully responsive WordPress theme. It’s a fully customizable land SEO friendly WordPress theme. It offers number of theme options like Custom Background Support, Custom Menu, Custom Colors, Custom Front Page Settings, Dynamic Widgets, Google Fonts, Slider and much more. Another attractive and fully responsive WordPress theme designed especially for news magazine style site. The theme offers you options panel to customize your site as per your choice, featured slider, ad widgets, YouTube video widget and social media. A flat and minimal design WordPress theme suited for bloggers and media to create unique and elegant looking websites. It’s a child theme of TwentyThirteen WordPress theme and works only with TwentyThirteen parent theme. Another photography WordPress theme that comes with many features like numbered page navigation, responsive slider, customizable header and footer, four page layouts, and custom widgets. Quest is a great and flexible WordPress theme that offers a powerful click, drag and drop page builder to help you create amazing pages to showcase your content while offering a slick user interface therein increasing your user experience. You can create a website like blog, portfolio, online store, magazine, photography and so on. You can easily customize your website layout including background mages, colors, typography and much more. 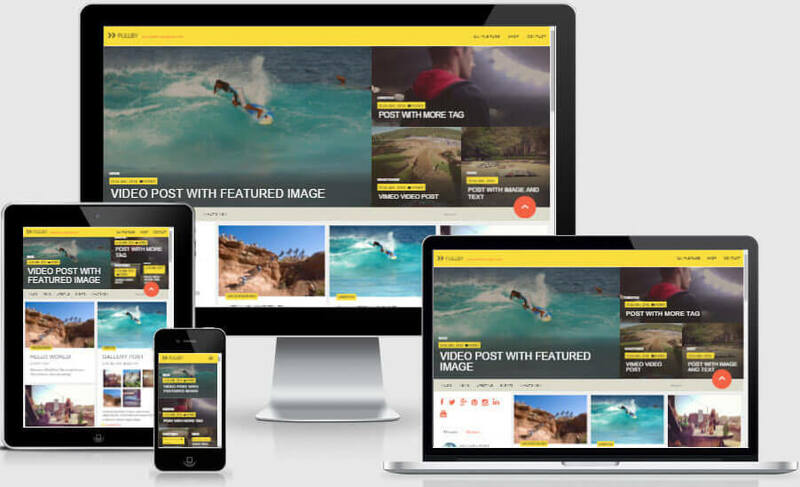 Stanley is yet another great amazing and professional looking WordPress theme. It has features like clean interface, powerful theme option panel to customize your website from every aspects, drag and drop homepage builder to custom design the site with so much ease, fully responsive design that look awesome even in small device screens to attract a wider customer base. Duena is a simple WordPress theme designed for personal blogs. It can make your site look very professional with an attractive inbuilt homepage slider. Showcase your content in Style with Photoshoo, a very attractive Bootstrap based WordPress theme. The Theme Options Panel let you manage the settings for your site Logo, Favicon, Social Media links etc. School is the one you should go for in case you are looking for clean, fully responsive WordPress theme that is compatible on all devices. Quite contrary to the name the use of this theme is not just limited for School but can be very well used to setup Business site. The theme Options Panel help to customize the theme as per your requirement. Unconditional is a fully responsive premium quality Bootstrap WordPress theme with a very attractive design that look great even in small screen devices. Its Jetpack powered portfolio enables both standard and portfolio single view. And its design make it perfect for both business sites and normal Blog. If you are planning to opt for a free WordPress theme then it’s better to go for a Bootstrap based WordPress theme since they are more flexible, responsive, customizable, and user-friendly. I hope this post has made you fall in love with the bootstrap and it was worth your time. With the assumption that you had at least zeroed in one theme that meets all your requirements we sincerely wish you to spread the word. Knowledge shared is knowledge gained. Let your fellow blogger friends know about the existence of powerful and yet simple themes developed from Bootstrap.